Google Nexus 5 phone to join Nexus 7 tablet? | What Hi-Fi? 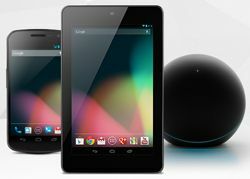 Google Nexus 5 phone to join Nexus 7 tablet? The next device in the Google Nexus family looks set to be a Google Nexus 5 smartphone, if reports emerging are to be believed. GSMArena claims to have been tipped-off that the next Nexus device will be a 5in smartphone based on the forthcoming HTC Droid Incredible X. As well as a 5in screen, the phone would have 2GB RAM, 64GB memory and a 1080p display. Based on the HTC Droid Incredible X, a Nexus 5 could have a whopping 480 pixel per inch (PPI) screen, which would be rather impressive to say the least. The iPhone 5, albeit with a much smaller screen, has a 326 PPI. This Nexus 5 phone would launch with a new version of the Android OS, which would bring subtle rather than wholesale updates to Android Jelly Bean. Google re-launched its Nexus family of products in July this year with the Google Nexus 7 tablet – the 7 referring to the 7in screen size of the tablet – the first Google-branded tablet.